For over twenty-five years Noam Chomsky's prolific political intervention has enlightened and inspired radicals while enraging their opponents in the halls of power. 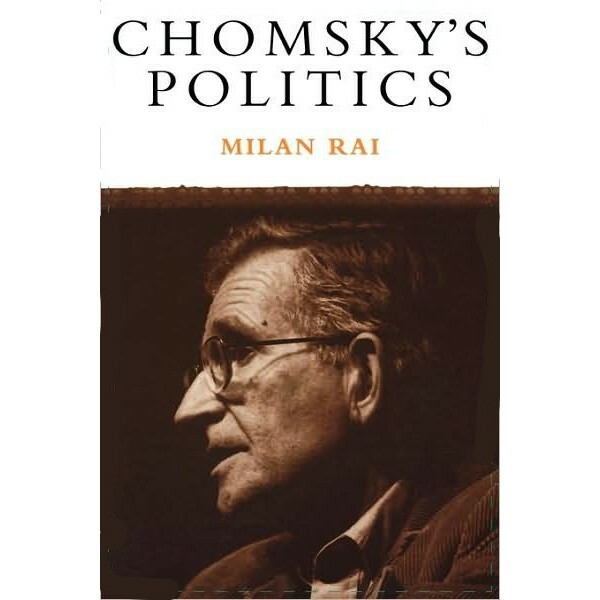 Beginning with a concise biography of his subject, Milan Rai presents a sympathetic yet probling analysis of Chomsky's critique of US media and foreign policy and his vision of a libertarian socialist future. Drawing on the entire range of Chomsky's prodigious output, including little-known interviews and articles, Rai examines Chomsky's assault on journalistic self-censorship and business control of the mass media. He shows how Chomsky challenges the US view of itself as a defender of democracy and equal rights by uncovering the hidden motivations of its foreign policy makers. Rai draws out features of Chomsky's outlook that are sometimes obscurred by a rapid coverage of a wide range of issues. In particular, he emphasizes the importance of Chomsky's cultural critique in his ordering of political priorities. Milan Rai worked with Noam Chomsky in 1993 and is an indepdendent researcher in the peace movement. He was awarded the 1993 Frank Cousins Peace Award for Research by the Transport and General Workers Union. NOAM CHOMSKY is not easy to ignore. Perhaps the best known intellectual dissident of today, his books turn up in all the major bookshops and both RTE and Channel 4 have run programmes about him. A measure of his influence is that an unpublicised talk in Dublin a few years ago drew close to 1,000 listeners. This book gives an overview of his politics and work spanning a quarter of a century. The sheer volume of his written work is as impressive as the content is challenging. A professor of linguistics by trade, Chomsky has written extensively on the evils of American foreign policy, media censorship, and the complex issues of power and its manipulation by politicians and capitalists of all kinds, and about what constitutes real democracy. The extent and rigour of his criticism of modern capitalist systems is such that he is often dismissed as too radical even by those who define themselves as left-wing. Chomsky defines himself as a libertarian socialist or anarchist. He has little time for orthodox left wing positions, especially those of the Leninist tradition which he rightly defines as authoritarian and as capable of abusing power as any capitalists. He comments "to libertarian socialists, at least, socialism and freedom are inseparable. There is no socialism worthy of the name under a party dictatorship". One of the difficulties for anarchists, according to Chomsky, is that both the major propaganda systems of the modern era colluded in distorting the meaning of socialism. Both Washington and Moscow found it convenient to identify the totalitarianism of the Soviet Union with socialism. "For the Bolsheviks, the goal of the farce was to extract what advantage they could from the moral prestige of Socialism, for the West, the purpose was to defame Socialism and entrench the system of ownership and management control over all aspects of economic, political and social life". Chomsky has often expressed his preference for that tendency in anarchism which "merges, or at least inter-relates very closely with a variety of left-wing Marxism, ...radical Marxism merges with anarchist currents". He states that the ideas of libertarian socialism are "exactly the appropriate ideas for an advanced industrial society". Chomsky has been criticised even by admirers of his work because he does not offer specific solutions to the evils and abuses he identifies. "I don't think I'm in any position to tell people what to do ....If you tell people to get seriously involved in dissent, they're going to change their lives. This is not the kind of thing you can dip your toe into and then walk away from. If you're serious about it, it is going to affect you. I don't feel in any position to tell people how to make these choices." Despite this, however, he is very clear that intellectuals, for example, because of their privileged access to knowledge and thus power, have a moral duty to propagate the truth and expose lies and cover-ups in government actions and in the media. He advocates a range of strategies and tactics from protest campaigns to lobbying politicians judged by the criteria of effectiveness. Even limited reforms are not dismissed as short-term goals. He suggests that political activists have a duty to ensure that their actions do not result in further repression for the populations and groups suffering the worst oppression including mass murder and genocide as in East Timor. He dismisses much of the orthodox left-wing positions and writings as irrelevant to the real issues and struggles in the world. Chomsky's vision is a challenging and inspiring one. His radical libertarian critique of state power and media manipulation are powerful tools for activists. What is missing is a strong argument for the development of revolutionary theory and strategy which will help activists to resist the temptation of authoritarian solutions to problems of social change. It is curious that Chomsky has written so little on this specific subject. Despite these reservations, this book is well worth reading as an introduction to Chomsky's writings.